Online Registration is now OPEN Registration will reopen at Weigh-Ins $50.00 late-penalty applies. Tickets are now on sale. Be sure to purchase your tickets in advance as the show tends to sell out. Prejudge - Friday May 31 | 12:00p.m. Finals - Saturday June 1 | 9:00a.m. Thurs. May 30 - 6:00 p.m. to 8:00 p.m.
or Fri. May 31 - 8:00 a.m. to 11:30 a.m. Coaches wanting access to the backstage area during the CPA Provincials require a backstage pass. Is your business interested in sponsoring a class at this years CPA Ontario Championships. Absolute Touch is the Official tanner, makeup and hair sponsor of the Toronto IFBB Pro Qualifier. Stone Photography Studio is the official photographer of the CPA. Pre-book your session. Toronto Pro SuperShow has secured group rates at a variety of hotels in downtown Toronto. Competitor Video Critique service will be offered. We focus your idea into a unique vision and identity. Prejudge - Friday May 31 | 12:00p.m. Finals - Saturday June 1 | 9:00a.m. How can I verify that I am qualified? If you are unsure of your qualifications to compete at the CPA Provincials please contact the CPA at memberships@physiqueassociation.ca . How do I become a member of the CPA? To become a member of the CPA go to the CPA Website and click on "Join Now"
What are the rules and regulations to compete in an CPA Event? The rules and regulations to compete in an CPA event can be found on the About page on the CPA Website. 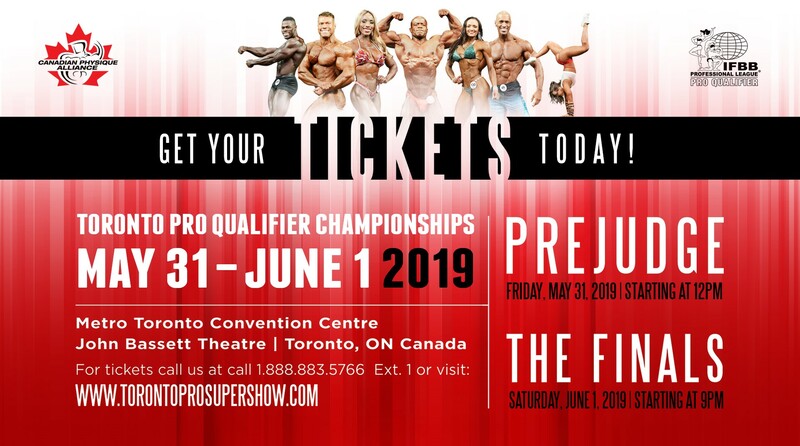 The Toronto IFBB Pro Qualifier is an annual event held in conjunction with the Toronto Pro SuperShow. It features the best physiques in the province. Overall Winners in the Open Classes receive an IFBB Pro Card.